1) House not facing a T-Junction or pole. Anyone can update me of other important feng shui to note before a purchase is made? To all the Feng Shui gurus out there : Is garden is facing North-West and direction of house facing Nort-East is advisable? neel>>2) House facing South. -- Not true. You need to match your 'life gua' with the house. How to match 'life gua' ? You can go to . ://..joeyyap.com --> Tools --> 8 Mansions Calculator and key-in your birthday to get the 'gua' number. You will find which direction is auspicious for you. Personally I take 8 mansions for direction of house and use Flying Star for the internal layout of house. Conbine both for a better result. wow .. you really feng shui master ! how do you use flying star ? What if the gate outside on the PORCH is SOUTH and the door in the house is WEST. Which direction do you follow as the main direction of the house ? I am not master lah, just read many book and article about feng shui and still learning. I am just giving out some basic advise here. There are many way to find the 'facing' direction. It is very much depends on the structure of your house. Usually we take the main entrance as facing direction. If you are using your secondary entrance or side entrance more frequent than your main entrance then you might need to consider to use the side entrance as facing direction but again, it depends. For 8 mansions, just devide your house into 8 sectors according to the 8 direction and you should know the 4 auspicious and 4 inauspicious sectors according to you 'gua'. If you main door in located at the auspicious direction eg. Sheng Chi, then you have a good feng shui. Of course you have to look at other important areas like bed room and kitchen too. If you are serious about feng shui then you have to look into Flying Star which I believe is more effective. You can use the tools in ..joeyyap.com to get the chart of flying star. You need to know the house's completion date and the facing direction of the house. Using the chart, you can devide your house into 9 sectors and you will get the mountain star and water star (number in 1 to 9) in each sector then we will see the combination of stars whether they are auspicious or inauspicious. Currently is period 8 (2004-2023) so the auspicious star is 8, any combination with star 8 is consider good. Flying star is much more complicated compare to 8 mansions. There are many factors that will effect the 'chi' and I can't tell you all here. You need to do some read-up else get a good Feng Shui Master to do it for you. Well, it is good to answer you question here too. well, here i am confuse. the house my husband is interested is facing the NE but the entrance form the garden to the house is facing NW (from inside looking to outside) and his sheng chi is NE. so the facing of the house will be consider NW ? I think the auspitious direction will follow my husband since he's the breadwinner of the house. Flying star is more complicated. Dont understand how to apply the combination numbers to the house yet. well, guess i will need to think of flying star only after i sorted out the auspicious correct direction of the house! Yes, the facing direction of the house should be NW, ignore the main entrance to the garden. Actually you not really need to know the facing direction for 8 mansions feng shui. The 8 sectors divided by black lines are for 8 mansions feng shui and the 9 squares devided by red lines represent the flying star feng shui. If the main door is located somewhere good for 8 mansion as well as flying star then you are having a very good feng shui for the house. 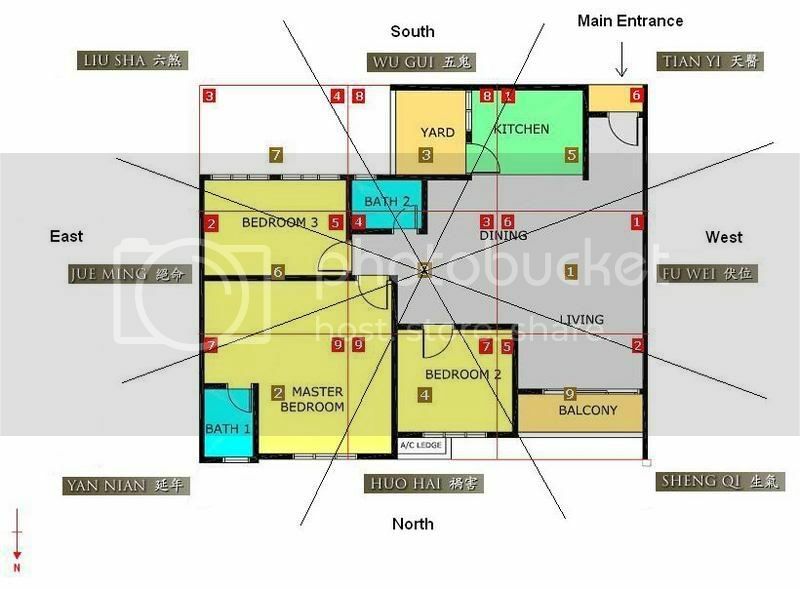 In the example, the main door is facing Tien Yi for 8 mansions (good but not best) and located at 1-6 sector for flying star (also good but not best, better for lady owner). In flying star, the house (consider the whole unit) is facing South but not SW.
alright ngou ..i'll do my own analysis. somewhere good for 8 mansion will be e.g. sheng chi but where will be the best sector for flying star? too bad i cant read chinese..awy it was GREAT having you in this forum! Right now (year 2004-2023) is period 8 for Flying Star. Basically any combination with star 8 is good. Flying Star takes every 20years as 1 period. Star 2, 3 and 5 are bad star, avoid them. Each star has each own characteristics and you need to study the chinse 5 elements (metal, wood, water, fire and soil) for its relationship. So am I right to say if the house main entrance falls on the Sheng Chi and flying star sector no.8 then it is a very good Feng Shui house? Not all the time can get the best leh .. Didn't come to this topic lately. Yes, you are right. For 8 mansions, Sheng Chi is the best. For flying star, star no. 8 is the best for this period but also not bad in other period as it is a wealth $ star. Yea, not all the time we can get the best but try to get the best combination or else build your own house Well, try to take Flying Star as the primary choice. 2 blocks also facing the Mosque likely roof ( sharp top.. )... like below.. Residential an option on the highway next to the road, it is impossible for the astrologer to health and are at risk. Near the railway construction adjacent to the residential. Train speed, high-speed trains between will have a strong vortex flow, and gas flute calls, people will not be able to peace. on the health of disadvantaged people. Terrace or the master bedroom is on the corner of the building near the corner or, as a wedge, moved into residential centers, Fengshui called knife come, living in the house this will make people feel that unbearable, and I feel bad, will certainly have adverse health effects. Foreign Secretary electricity column steeple, Cross, Eagle's Nest, building their minds, according to Fei-inferred. If nine Purple side, which should fire six Belarus, pulmonary bleeding. Cannot say all units in the 2 blocks are having bad fengshui. 1. The 2 blocks have to be very close to the mosque, say less than 50m destance. 2. The sharp pole have to be at the same sea level with your unit. Higher or lower units won't be effected. 3. You must see the sharp pole from your windows or door. Behind the wall is fine. 4. You have to see it hits which sector (or star in that sector) of your house. It will effect certain family member in the house only. 風水輪流轉。。。 You probably will see all those things everywhere. Malaysia is an Islamic country, which residential area don't have mosque? Noise, light, road & junction, highway are everywhere, how are you going to avoid them. Yes, you can solve certain effect using modern feng shui. Classical feng shui don't have such thing. Thanks for that Feng shui tips! may i know, if the house is facing a transmitter tower (about few km away), how can we avoid the bad effect to us? frankly speaking, it's not easy to get a perfect feng shui unit everywhere, it's hard to get one in a developed or developing city. 3) for a developing city, you won't know what is going to happen 10 years down the road... for example, i believe everyone here heard of "last time here is a small road, now has became main road, so busy and noisy..."
"Feng Shui lun lau zhun" Feng Shui have time factor, it will change when the time come. what can i do when my house is lower than the road?